80 Minutes of Regulation: Maryland State? I stuck around after work today and played around on Photoshop a little bit (full disclosure: I was actually working on stuff for the wedding). This is what happens when a one-track mind plays around on the 'shop for a bit. So let me start by pointing out that I love both of my alma maters damn near unconditionally, for all their faults--name being one of them. Sure, South Florida is in West-Central Florida, and sure, the University of Maryland, Baltimore County is the only non-community college in the country to have "county" in its name, but I love them anyway. That said, let's, for shits and/or giggles, entertain for a moment the thought of my four letter alma mater in suburban Baltimore considering a name change. A fitting name would clearly vault it from its subordinate-to-the-flagship regional moniker. What would put it right up there? Maryland Tech? Sure, there may be some truth to it, but we want to keep the beloved humanities and arts folks happy, so let's go in a different direction. Maryland State University. Aha! Now we're combatting one of the limitations I mentioned before--not having a power letter. Now State can wear their S proudly. And the use of the Maryland flag I've been talking about? I've got you covered there as well--at least the Calvert portion, which is more closely tied to Baltimore, and, more importantly, black and gold. Behold: Maryland State! With all respect due to Stanford, whose logo I jacked wholesale. So there you have it. I'm not saying a change is going to come. I'm not even saying I want a change to come. But should it come, we'll be ready. I'd like a little Maryland flag logo on half of that, and the school colors like you have now on the other half. 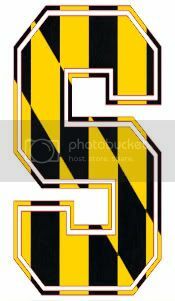 MD flag logo like how on the top half? Top or bottom, doesn't matter. Something to distinguish the "Maryland" portion to it.